Malignant Pleural Mesothelioma is a rare cancer, affecting the pleural lining of the lung and chest wall. The lining of the lung is made up of a thin watery sheet of cells divided into the visceral layer and the parietal layer of cells. The visceral layer is closer to the lung; the parietal layer is closer to the chest wall. Malignant Pleural Mesothelioma is an aggressive cancer. Malignant Pleural Mesothelioma is a disease of the lining of the lung. It was first reported in the literature in 1767 in France. In 1870, the first pathological description of pleural mesothelioma was made in the literature. In 1890, the first case was reported in the United States. In the 1920’s there was agreement among physicians on the term mesothelioma of the pleura to describe the tumors that where in the pleura. During this time, it was thought that the tumors were metastatic from another source. In Germany in the late 1940’s the connection was made that asbestos exposure could be the primary cause of pleural mesothelioma. In the 1950’s, in South Africa the confirmation of the link between asbestos and mesothelioma was made by a Dr. Wagner. The association was further confirmed between asbestos and mesothelioma by eight case control studies conducted from 1965-1975. Most people with malignant pleural mesothelioma present with gradual onset of nonspecific symptoms such as chest pain, shortness of breath, fatigue, cough, hoarseness, night sweats or dysphagia (difficulty swallowing), unwarranted weight loss. Symptoms of malignant pleural mesothelioma are the same as many common diseases. Recent abstract in the Journal of Clinical Oncology identified that the median time between first lung-related visit and a diagnosis of malignant pleural mesothelioma was 77 days, with times ranging from 23 days to 258 days. For most patients diagnosed it took visits to two distinct health care providers to arrive at the diagnosis. Cell Types – Our bodies are made up of cells. Cells have different functions to keep our bodies healthy. There are 3 different recognized cell types of pleural mesothelioma: Epithelioid, Sarcamatoid, and mixed. Occurrences – There are approximately 2,500 to 3,000 people per year in the U.S. diagnosed with malignant mesothelioma- approximately 75-80% are malignant pleural mesothelioma. Of that number, a direct correlation can be established with asbestos exposure in approximately 80% of cases. In the other approximately 20% of cases, there may have been asbestos exposures that were not discovered or identified at the time the exposure history was taken. Causes – Exposure to asbestos -inhaling microscopic fibers is the only well-established cause of Mesothelioma in the United States. Asbestos fibers can become lodged in the lungs, and travel to the pleura, where they can cause damage to the cells and result in cancer. 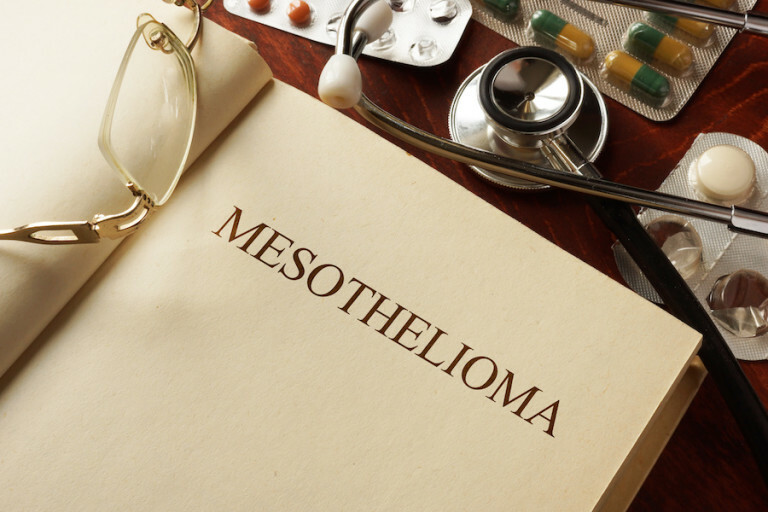 This process of developing Mesothelioma can take decades to manifest as symptoms. It may take 20-50 years or more for Mesothelioma to develop. Of the four types of mesothelioma, pleural accounts for 75-80 percent. Once these fibers are trapped this can cause a slow inflammatory process that can convert cells to cancer. Researchers are not sure how this transformation takes place but there are theories. Some factors may make individuals more susceptible to developing mesothelioma or asbestos related diseases. Smoking can weaken lungs but does not increase the risk of mesothelioma in anyone with a history of asbestos exposure. Some researchers believe that genetics are a factor. This may explain why some individuals will develop this disease while others who have had the same exposure will not. Most cases are related to occupational exposures. Shipyard workers, factory workers, mechanics, construction workers and those who have served in the service have the greatest potential for developing this disease. There are patients who have been exposed outside the workplace, as asbestos was contained in many household products such as joint compound and floor tiles. Also, it has more recently come to light that many consumer products, including talcum powders, contained asbestos and caused many people to unknowingly be exposed. Multimodality Therapy – Includes chemotherapy, surgery and radiation, used to combat the cancer cells at different points of the therapy. Extra-Pleural Pneumonectomy (“EPP”) – EPP is a surgical option for someone who has pleural mesothelioma. The entire lung is removed, part of the pericardium, part of the diaphragm and part of the parietal pleura. The chest can be opened in the front or the side. The incision is approximately 9 inches in length. The surgeon removes the diseased lung and any other visible cancer including the lining of the chest, lining of the heart and diaphragm. This surgical option is performed on patients that are good candidates for surgery and have good health otherwise. This procedure is usually offered to patients who have early disease and are expected to withstand this surgery. This surgery is known to control disease progression, improve quality of life, and improve breathing. Of course, the benefits must outweigh risks. Some risks include internal bleeding, respiratory failure, pneumonia, infections, and blood clots. The easiest of tasks when recovering from this disease can be physically and mentally challenging. Radiation – The goal of radiation therapy is to prevent cancer cells from spreading and to improve life expectancy. Often doctors prescribe radiation in addition to other treatments or for palliative reasons alone. Radiation may be to manage symptoms or to control spreading of the tumor. Radiation therapy can be used in most stages of mesothelioma. External Beam Therapy – External Beam Therapy is given to targeted areas to prevent healthy cells from being damaged. The most common type of external beam therapy is Intensity-modulated radiation therapy IMRT. This is a three-dimensional radiation therapy that changes the strength of the beam of radiation, allowing to target a specific area. Treatment is usually five days a week for several weeks. Brachytherapy – Brachytherapy is usually not used for the treatment of mesothelioma. It plants a radioactive substance inside a tumor while in surgery or during an imaging scan. Immunotherapy – Immunotherapy treatments use drugs to stimulate a patient’s immune system to kill mesothelioma cells. Immunotherapy is still being developed and awaiting FDA approval there are many clinical trials. Clinical trials are currently testing immunotherapy treatments and are very encouraging with their results. For patients diagnosed with malignant pleural mesothelioma the options today have never been as extensive. In the United States, there are Centers of Excellence that have mesothelioma experts and teams of professionals offering a multidisciplinary treatment options to patients. Please let us know if you have any questions.